FROM WIMBLEDON — Sam Querrey is lurking. The big hitter will have to face the other good — or at times, great — Gael Monfils. The American has a gigantic serve and forehand, and now, he is pretty decent at the net. That is why he is currently No. 11. He is a happy, go-lucky person. The same goes with the Frenchman, who doesn’t lover grass. When he is mentally sound, he can throw in his massive first serve, whale on his forehand, and he is so, so fast, running up and back. There will be some short points. Whomever can read the other’s strengths and weaknesses will win, in five tough sets. 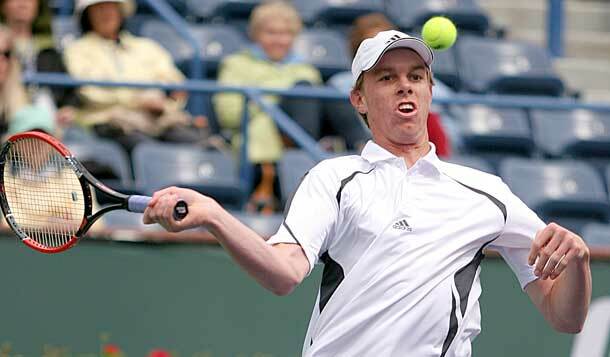 It will be Querrey. Serena Williams is rising, slowly but surely. On Friday, she will go up against Kristina Mladenovic, which could be a fun match. The Parisian hasn’t played very well during the last year. She loves to crack the ball, and she can rush the net a lot, but she is erratic, and she is not too quick. But she is really looking forward to challenging Williams. I would think that Serena will win in straight sets, but maybe Mladenovic will shock her. She has to attack quickly and often. No. 4 Zverev is incredibly powerful, with his first serve, with his forehand and backhand, down the line or crosscourt. Over the past two years, he has improved by becoming much more consistent. The San Diego native Fritz is also young and is pretty bright. He is also powerful, and he likes to go for it. Neither of them totally understand how to play at Wimbledon yet, but Zverev will win in four sets. The Belgian Flipkens has been around forever. She has gone deep at Wimby, as she loves to mix it up, to spin it, to whack it. The former 2017 RG champ Ostapenko is still learning, as she is very young and while she can blast the balls everywhere, still, she makes a lot of mistakes. Flipkens will fool her, and take her out in three sets.